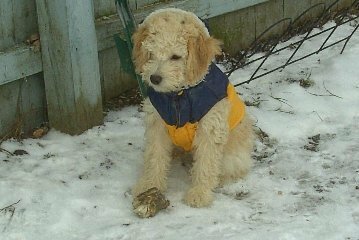 Our goldendoodle has been a great friend and companion. This is a sister of Soda. I think you called her "Smiley" at the time of adoption. We named her Biscuit. We love to hear how our puppies are doing in their forever homes. Hope you are doing well. I took Streamer to the vet today for his final set of shots as well as rabies shot. We went to the beach with Streamer this weekend. Here are some pics. He got good and stinky and loved it. 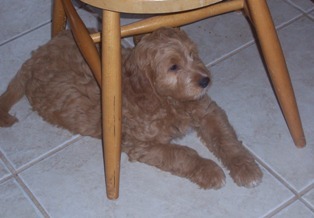 The puppy did great, we are going with the name “Baxter”, thought it went well with our other dog Buddy. He rode very well in the car, (the traffic wasn’t too bad). He immediately took to Buddy, they are getting along great. He slept with Buddy the past two nights and is doing well. He has gone on numerous walks and is getting better on the leash. We are heading to the dog park later and sure he will love it. Here are some pics for you. I tried to get one of the two dogs together but no luck yet. 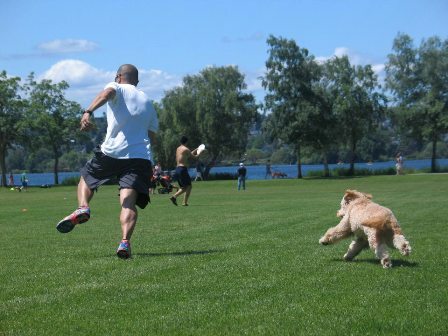 We took him to the dog park, at first a little apprehensive, but then warmed right up. He even had his first “dip” in Lake Washington. He loved it. He is a very sweet boy. Our Reilly Girl is doing so well! We love, love, love this puppy!!!! 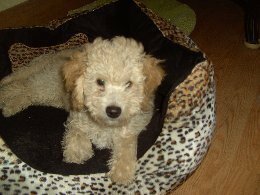 She is a quick learner - so smart, already potty trained, sleeps through the night (in our bed!) and is so great with both the kids and all their friends. She's eating well and growing! Loves to be blow dried after a bath. We've taken her hiking on Tiger Mountain a few times - her wild side comes out! She has the perfect temperament. We take her everywhere with us. Thank you sooooo much! I've referred a couple of people to you - Reilly catches everyone's attention at baseball games, the dog park and playgrounds. She's just so cute and sweet. Hope all is well and you are enjoying your summer. 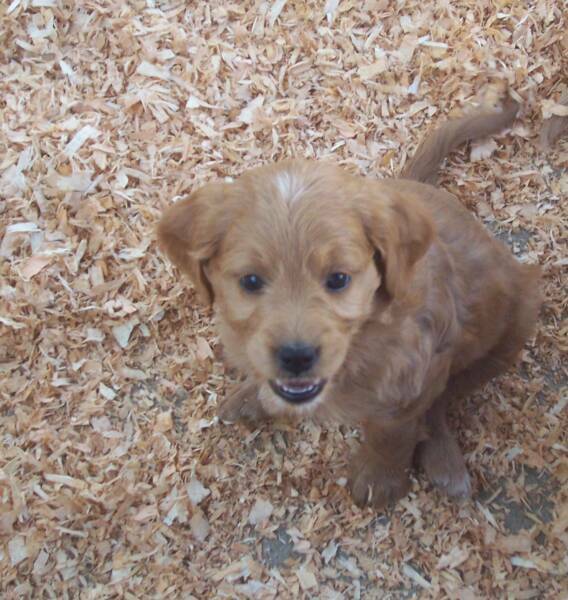 Your new litter is adorable. Here is a picture of Eddie with my kids. Thought you would like to see him. He is so sweet and the best dog! We love him lots! He loves our Newfoundland and they play together all the time. He loves to lay on the vents in our house and of course rolls over for belly rubs every day all day! He enjoys going in the car and absolutely loves taking showers with us! He just sits there while we wash him and cries if I won’t let him in. He is hilarious! We will send more photos as time goes by! Thanks again for a wonderful pup! Just wanted to let you know, your pups have been the BEST dogs ever!!! They both have the most wonderful disposition and love all people and other dogs. Been an absolute joy. 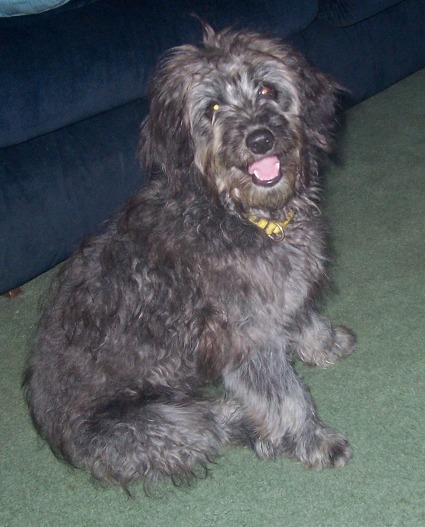 Here are some photos of "Reilly Girl" - now 9 months old. She is doing so great and we LOVE her so much! She is just the best puppy! She has been so easy to train and she loves the kids and is a real snuggle bunny - always wanting to sit with, on or next to somebody. She loves to go to the dog park and ride in the car. We take her with us everywhere! She loves to growl at herself in the mirror, but is pretty quiet as a rule. 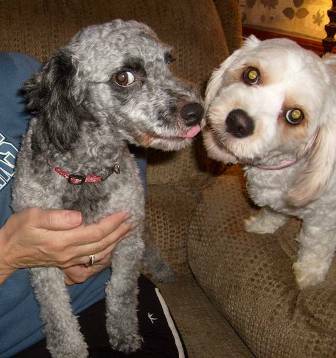 Reilly and Ella, our 3 year old, are constant companions and playmates. 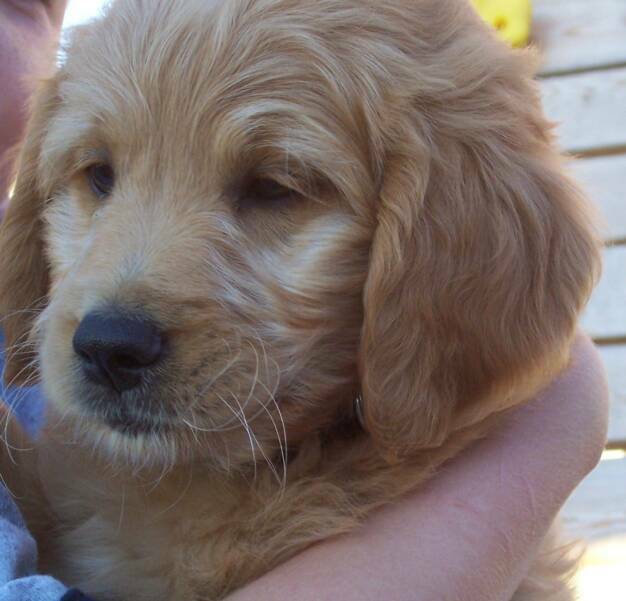 Thanks again for such a wonderful puppy with the perfect temperament for our family! We just love Rose/Breezy so much. It’s only been a day and she’s already learned a new command, and she has really taken to us. And us to her. We couldn’t be happier. The vet gave her a clean bill of health today. We’re thrilled! We’ll send you some pictures. We haven’t taken any yet because we’ve been so busy playing with her and buying her new toys. 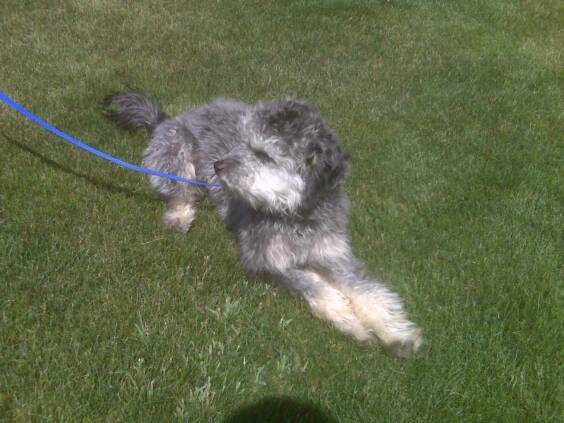 Gracie is getting lighter and lighter so I am assuming that she will be silver with a little beige. She is a real character and so smart. She was totally potty trained after we had her two weeks. She was crate trained after three days. She can sit, stay, come, fetch, shake hands and dance. Her dance is hysterical she does flips in the air and turns in circles. We are working on healing on a leash and she has almost got it. She is very energetic and loves every member of the family. Thanks for giving us such a wonderful dog. We love her! 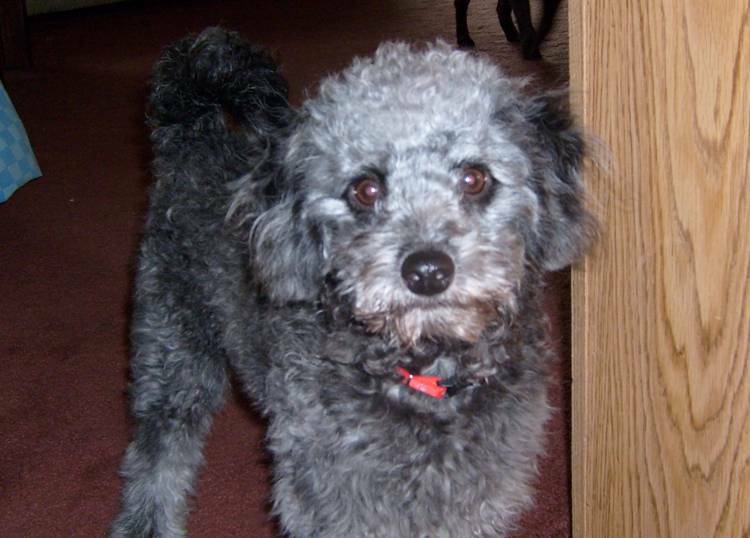 Gracie is from Soda and Skipper. Here is an update on Eddie! We love him so much and he is a great and very smart boy! Thanks again! 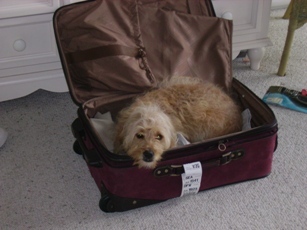 Gallagher had a safe flight, he was happy to end his trip and get out of the crate!! We got home, he met his family, ate some kibble, watched the 2nd half of the Super Bowl and was ready for bed. It was a long day for that sweet little puppy!! He is a total sweetheart, just as sweet as he is beautiful. He has a vet appt Tuesday, I can't wait to show him to our vet! 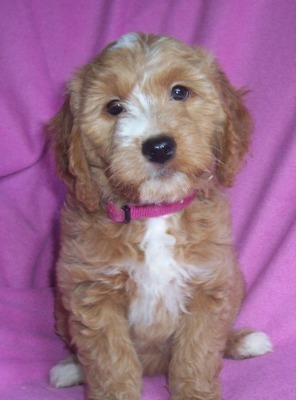 You sure breed absolutely gorgeous goldendoodles!! It's me. Gallagher taking some time from playing in the snow and hanging out with my new humans (oh they love me LOTS) to say everything is good here, Ohio is a good place for me!! NOT a problem with housetraining, he heads out to the fenced in back yard and checks the yard then takes care of business. He is as smart as he is BEAUTIFUL. 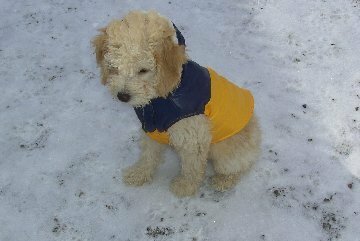 He likes wearing his coat outside, although he likes to hop in the snow, his puppy fur isn't enough help in the below zero weather when he has to take it outside. He has been to the vet 2 times, and has one more puppy visit to go. Gallagher came to visit during parent teacher conferences, and not much was said about kids once he arrived!! His feet never touched the floor in school, he was a huge hit there too! Gallagher is a smart, affectionate BEAUTIFUL pup!! He just celebrated his 6 month birthday with his dog and human friends this wkend. He is really a happy , smart pup, easily housebroken, loves to play and could not be a better dog. Everyone that meets him loves him, he is just that kind of pup. He looks like he could star in a Disney movie. 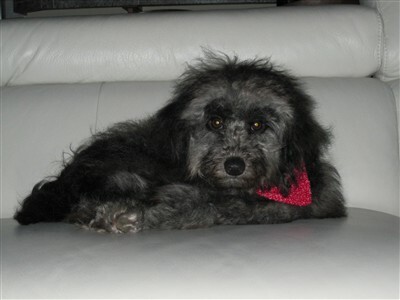 I will take some pics and send them, he went to the groomers for a 'big boy' haircut, and was a hit there too! His siblings have all been sold? I liked that phantom in the litter, she was a beauty too!! But then the silvers were awesome too! You have some gorgeous puppies, and their personalities match their beauty!! I will get some updated pics to you!! Just an update on Baxter. He is just amazing. We are now living in Denver and he has adapted well to the Rocky Mtns. Here is an update pic. He is sporting a summer crew cut! 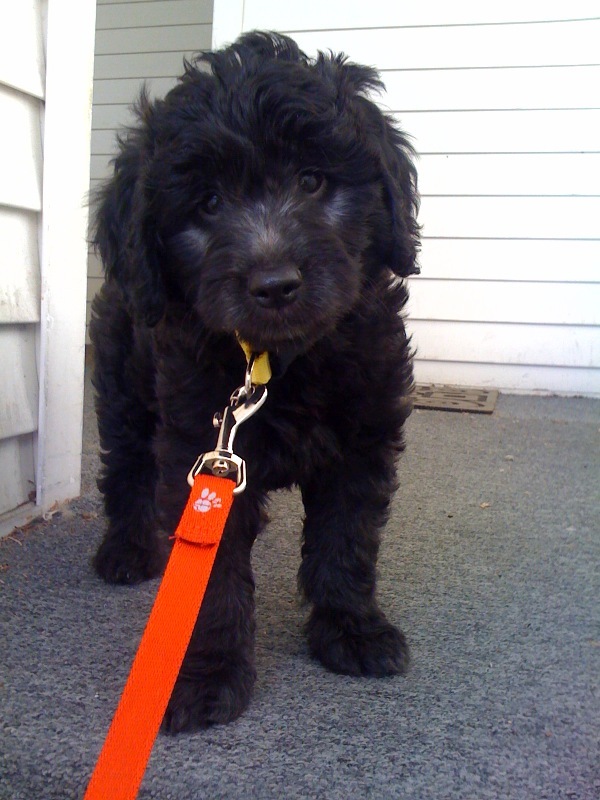 Is so great on the leash, no accidents, unbelievably smart. He is enjoying summer,LOVES to get dirty and swims daily in his kiddy pool in the backyard!! Gallagher is curly, but not that thick fleece like a sheep, he has beautiful ringlets. He weighs about 18 pounds, but looks bigger in the pics I think. He loves to dig holes, but he's learning!! LOL His other favorite summer hobby is pulling the plug out on his kiddy pool when he is swimming, he goes underwater to find it and waits to be chased around to get it back. He loves water, and will lounge in his baby pool (when he lets the water stay in) and watch for birds to land so he can pounce on them. He is a sweetie, much personality, and always ready for a good scratch!! than 1 week and is extremely smart - she learned to sit, lay down, etc. - she needs lots of cuddling time. She loves other dogs and children. She has a great temperament and has been a joy. Her name is Harley. Attached are the latest photos of Breezy. She had her summer cut last week, and has wasted no time at all diving into the water. She loves seaweed. As a matter of fact, she loves everything! She continues to be the sweetest, smartest dog we’ve ever known. We could not be happier. You might not be able to tell from the pictures, but her coat’s gone very silver. Much more so than when we picked her up. 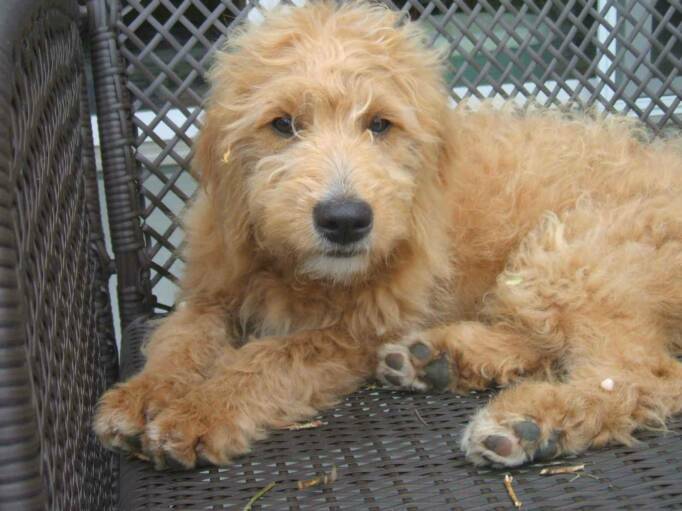 At this rate, she’ll be the silverest goldendoodle around. 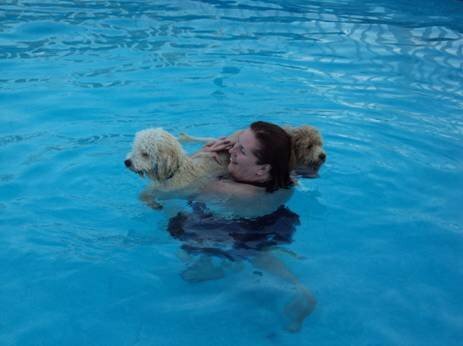 Gallagher has learned to swim, although he doesn't mind a raft ride when he gets tired!! 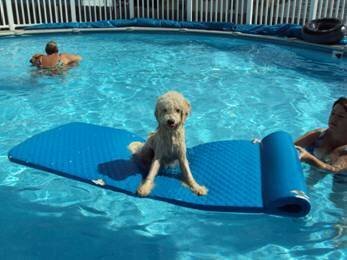 He was invited to a friends home for last swim before the pool is closed for the summer, and he had a GREAT time!! He is only about 20 pounds, the pic of him alone on the raft is very deceiving!! So sorry it has taken me so long to get back with you. I have been getting some cute pictures to send to you soon. We love her. 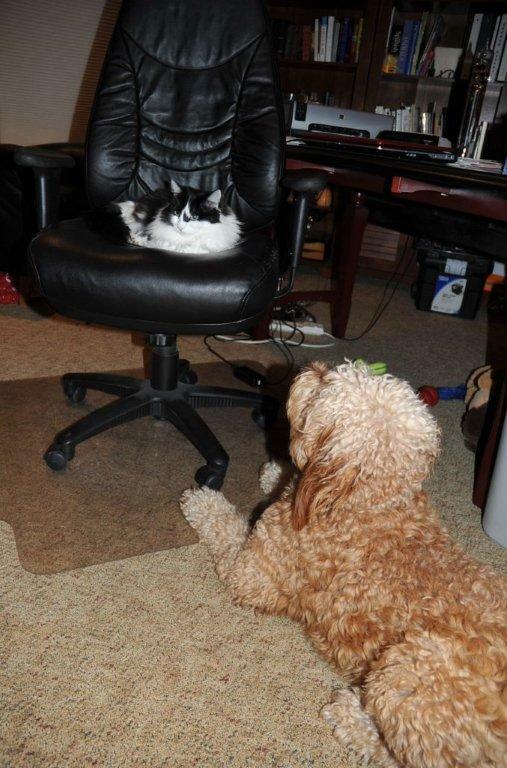 She gets along with Guiness (our other doodle). He thinks that she is his baby. We have decided to name her Kona. She sleeps in our bed and she sleeps through the night. Yeah!! And only 3 accidents in the house. Not on the bed though. We have really been enjoying her. She is a fun loving ball full of energy. I have had a lot of fun buying her new toys, beds, name tag and a crate, (that had to have a bed too). Another words she is very well spoiled. She goes to work with me everyday. We are truly blessed. Thank you. I will send you pictures in the next email so you can post them. Take Care. watch these giant doodles be submisive to him! Henry. I love having him in my life! Happy new year! 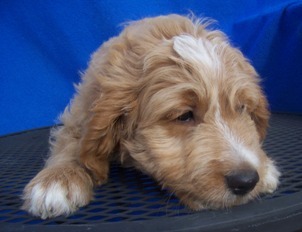 Attached are a few recent pictures of Reilly Girl, who will be two next month. She is doing great and we love her more than anything. Thanks again for the great dogs! Been meaning to write you and send you pictures! I can't tell you how much we LOVE ELVIS!!!!! He is super sweet, totally potty trained and the dogs all love each other!!! They all sleep on our bed with us and of course on my side of the bed! Elvis follows Eddie and Emmett out the dog doors to go potty in the pen and he had his first kennel experience over New Years. They said he didn't like it at first but soon learned how the program works. He did great as he stayed in the same kennel with Eddie and Emmett. He loves to come in the shower with me and gets soaking wet! He has mastered the stairs and jumping on the couch. 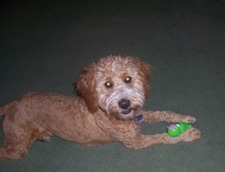 He has to have the same size chew bones as the others and is very crazy when he plays with Eddie and Emmett. He attacks them with a flying leap and it is hilarious! 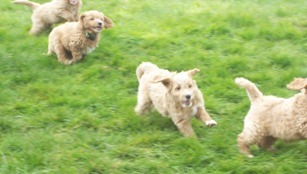 Just thought I'd fill you in on our active life with three of your Goldendoodles!!! We love them!!!! Have a blessed New Year and talk to you soon! all is well - and thanks again! I wanted to send you a few pictures of Falcor with his new best friend Cyrus and after his first haircut....he's settling in great and he was too smart for the puppy kindergarten class after 2 weeks so we're moving up to basic manners! Hope all is well and thanks again! Remember me? I'm Jazz from Planet Doodle. I'm doing very well and love being with my new Family. I have become best freinds with BayLee the Beagle and we play all the time. My Mom and Dad treat me so well and I am quite spoiled! They gave me a "little" haircut last week and I look quite handsome now.......and best of all I can see! I have a big sister here too - her name is Chooie and she is a Schipperke. We get along too but she won't play with me like BayLee. I am so happy here but still wonder whats happening with all me doodle family over in Graham and who knows where else. Hope they are as happy as I am! 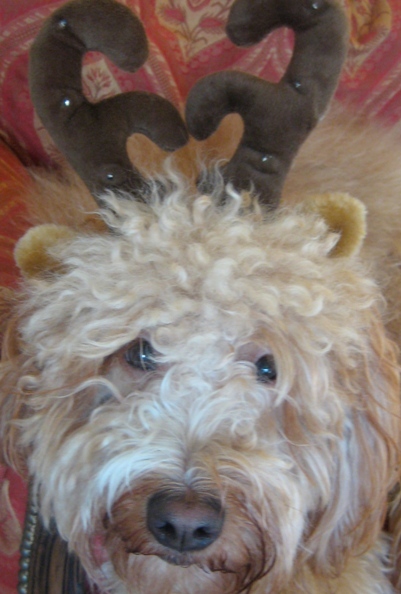 Hi Kathy – just wanted to send you a couple of new pictures of Henry. He’s doing really well and is such a sweet little guy with a fun personality. He goes everywhere with me and travels so well. Jazz is great and he weighs in at a whopping 13 pounds. We think he is pretty much full grown now. 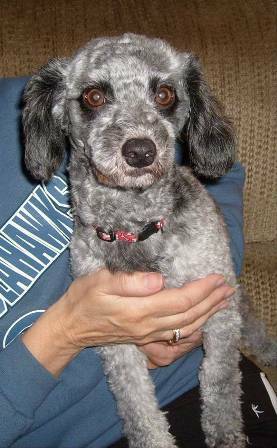 We were thinking about another Doodle but came across a Cavashon that was adorable and picked her up instead. Her and Jazz are best friends for sure and Baylee our Beagle likes both the new doggie kids as well. Jazz is really taking Bella (the new one) under his care and is teaching her everything she needs to know. We attached a picture of the two of them here. All the best to Soda and Skipper and the new ones to arrive! It's Jazz again from Planet Doodle. I turned 1 year old yesterday - boy do the dog day's go fast! I am doing great and have the best mom and dad who love me and spoil me lots and lots. 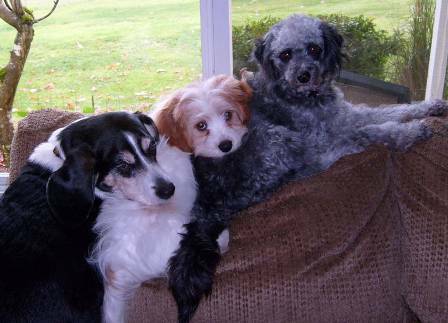 I still have my brother BayLee the Beagle and a new addition Bella the Cavachon. They are great and we play together all the time. 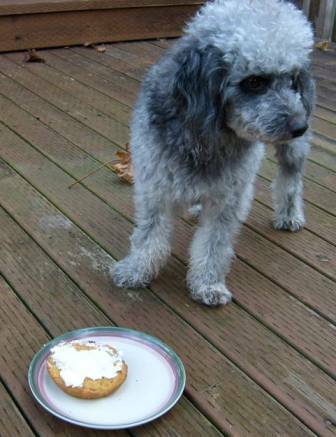 I had a great birthday party and mom and dad even made me a dog cake (Peanut Butter and Honey.......ummmmm ummmmm). I put a picture here to make you hungry :) Tell everyone back there I said hello (bark bark) and tell Soda and Skipper that their little Jazz is very happy and doing great. Henry is very silver! I get so many compliments on how cute Henry is. I had one woman come up to me the other day while we were sitting outside of Starbucks and asked if she could take his picture. He’s a sweet little guy and is soooo smart. 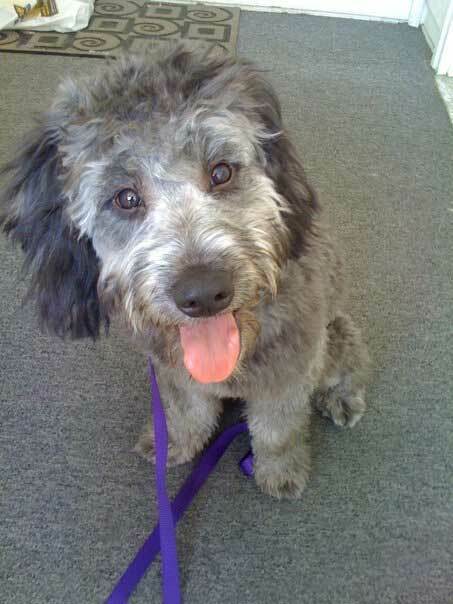 It's me again - Jazz the Doodle! I just turned two years old this past week and am as happy as ever. I love it here with my brother and sister and have turned into the activities coordinator for all of us. I am there to schedule play time, bisquit time, and lap time with mom and dad. I spend so much time playing all day long with my toys and especially my sister that I am all worn out by bed time. It's quite a life and i love it. I am very spoiled and deserve it all! I have a Grandma Bisquit and an Auntie Bisquit who help spoil me too. They always have special treats for me and my brother and sister. 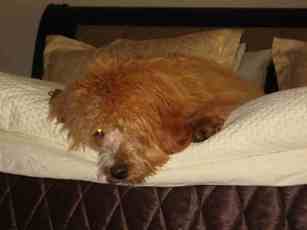 Awwwww the life of a pampered Doodle!! Tell Soda and Skipper that I am doing great and hope all my family over there is doing well too! We have had a few inquiries about playgroups. 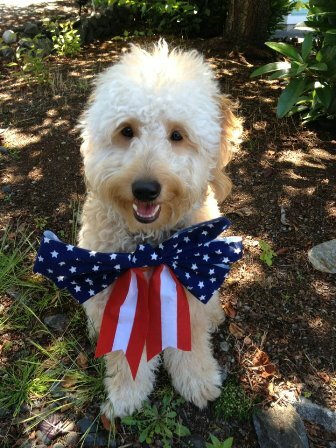 If you would like to get your goldendoodle together with other Solid Gold Doodles, send me an email and we will try to get you in contact with others in your area. Here are some areas we have had interest in a playgroup. 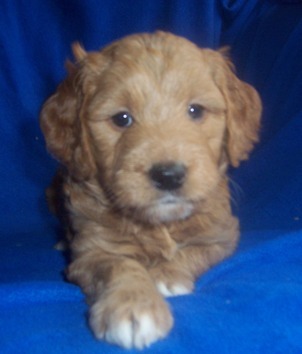 Goldendoodles are a cross between a golden retriever and a poodle. 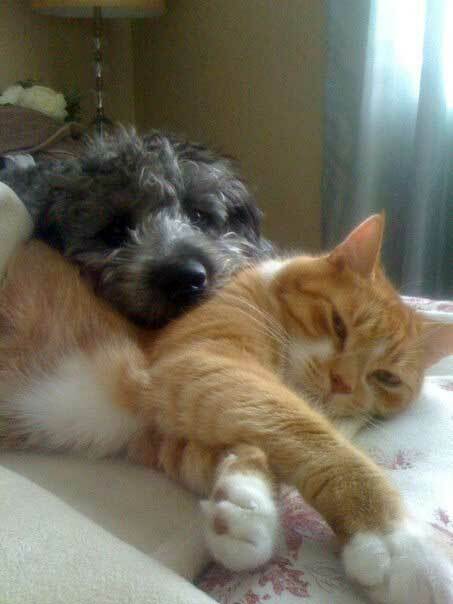 The advantage of crossing two purebred dogs of different breeds is called 'Hybrid vigor'. 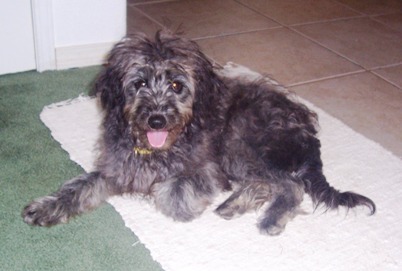 Resulting from hybrid vigor is a more genetically sound dog that is often healthier than either parent dog. 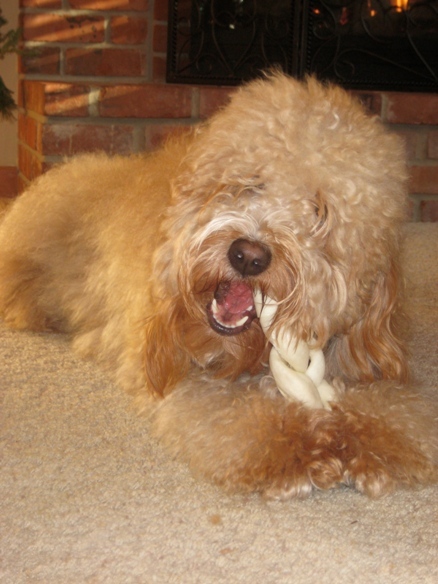 Goldendoodles inherit traits that are common in both parent breeds. 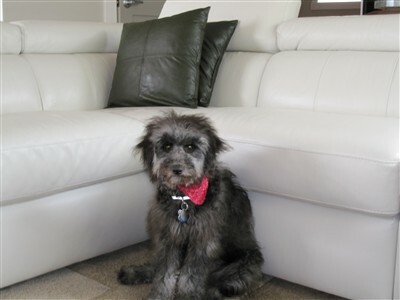 They are very intelligent, loyal, great with children and obedient. 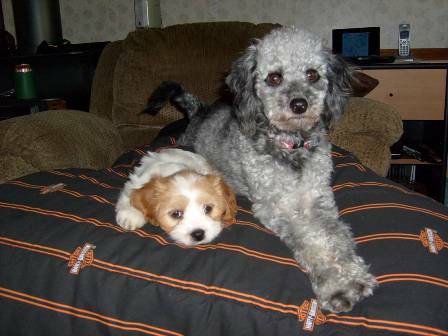 The size depends on the size of the poodle as well as the golden retriever. 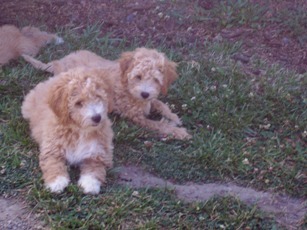 Our miniature goldendoodles range between 10-30 lbs. 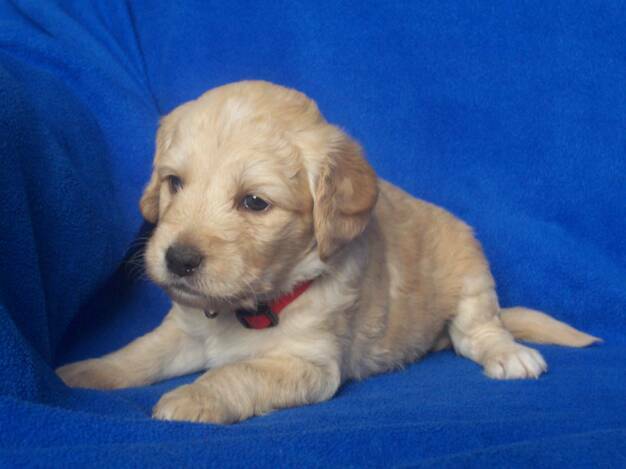 First generation goldendoodles (F1) come from a golden retriever parent and a poodle parent. They are a true mix of both breeds. They are low to non-shedding. 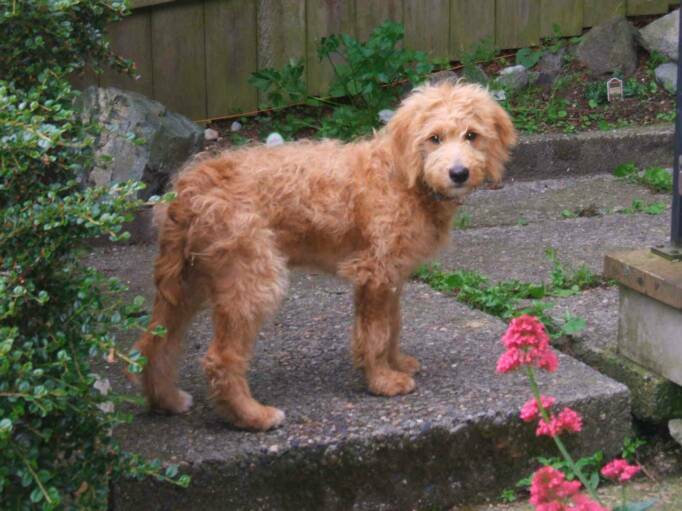 F1B goldendoodles come from a goldendoodle parent and a poodle parent. 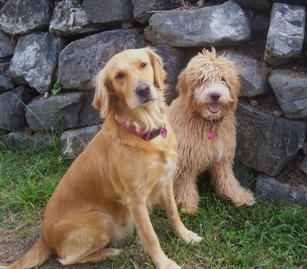 They are generally non-shedding because they have 3/4 poodle and only 1/4 golden retriever. 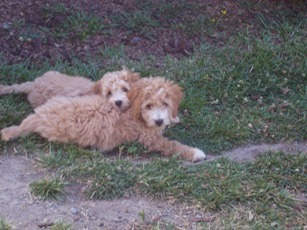 The miniature F1B goldendoodles are usually smaller. 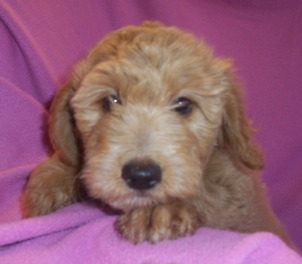 F2 goldendoodles come from two goldendoodle parents. 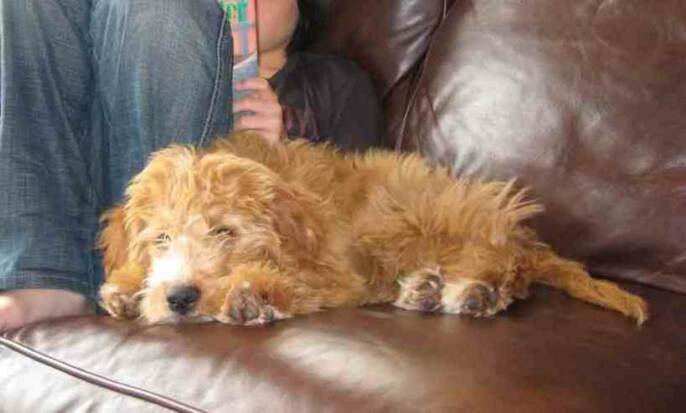 A goldendoodle coat can come in many colors. 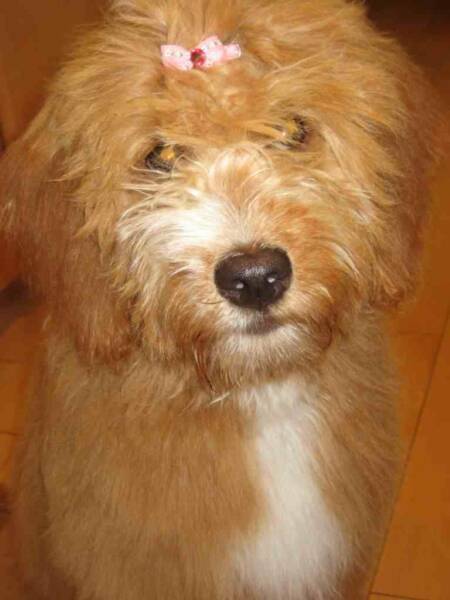 Thier coat can also be smooth like a golden retreiver or more fleece like, similar to a poodle. They require some grooming, mostly just regular brushing. Some coats are kept short while others are left long. 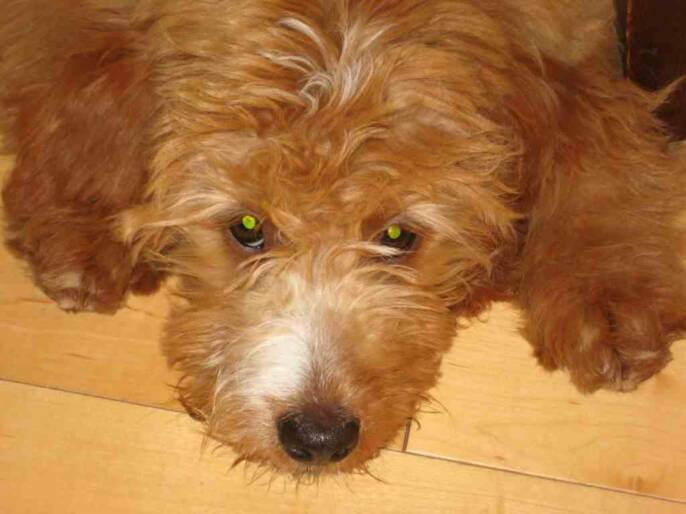 Goldendoodles like to be active but calm down easily when indoors. 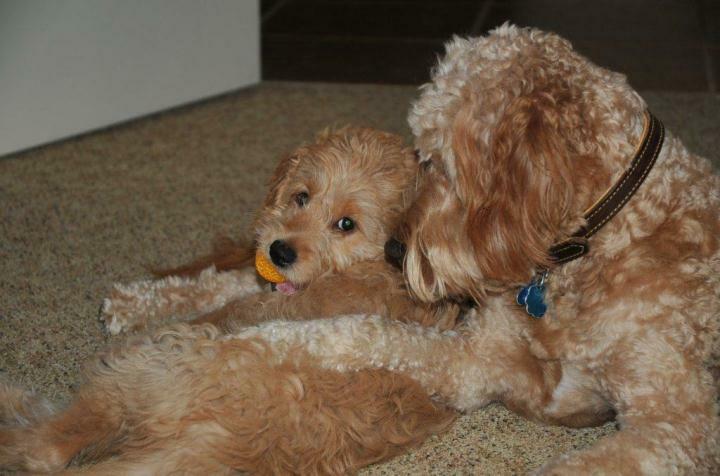 Goldendoodles are a people pleasing breed. They are easy to train and are often used as service dogs. Breezy is GREAT. Best dog we’ve ever had. Such a love, smart, fun, listens, and a cuddler when she calms down. We bought Orange Collar Boy (Peanut and Skipper's) from you last summer and just wanted to update you. He is doing great-we named him Reggie and he has been lots of fun. He loves the snow, to camp, the kids and lots of attention! Just wanted to pass along some pics. I just wanted to check in again.......It's Jazz the famous doggie from Planet Doodle! I turned three paws old this week and I'm still just like a little puppy. The kids did a great job naming me Jazz.....I even have my own Transformers blanket! I practice my battle and combat skills every day with my sister and we have a great time. I'm the caretaker for both my sister and my Beagle brother and they would be lost without me. 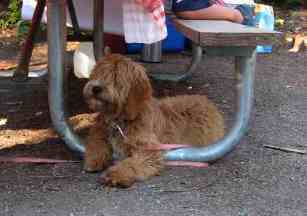 I tell my human mom and dad stories about all the doodles on Planet Doodle all the time and they love them. I'm just a happy go lucky doodle who loves everyone! Please tell all my brothers and sisters and mom and dad and all the kids there I barked a happy hello to all of you way over there!! Just wanted to give you an update on Coleman. He is doing great in his new home. We are doing well on house training and crate training. He loves going with me when I go to my quilting groups and loves to visit with my friends and family when they come here. He especially likes my grandchildren.. I have been walking with him twice a day and he is doing great on the leash. Now, I need to start on the sit, stay, and all those. I think he still misses his brother sometimes. I’ve been trying to get some of my friends to adopt him but to no avail yet. I wish I could afford both of them. I will keep you apprised on his journey her in Gig Harbor. Thanks for the wonderful dog that has added so much to my life in just two short weeks. Our Karma is doing well and growing fast! We aren't sure what we did with all our time before she came to us! need to "go". The problem now, might just be, that she knows she can go outside most anytime she rings her bell! She travels well, going in her carrier, in the back seat of the pick up whenever we travel, back and forth to somewhere. Now that it's a lot warmer outside, this has been not on such a frequent basis. Thanks...we sure do enjoy her! We've been meaning to send you a note and let you know how well Maggie is doing and how much we love her! She had her first vet appt last week and she got a clean bill of health...the vet was very complimentary of your approach to breeding:) she is starting puppy school next week and we are really looking forward to it. We will definitely keep you posted and send more photos. Thanks so much for everything...we can't imagine not having this sweet little girl with us! I just wanted to email you and tell you what a sweet girl you raised for me. Gabby is precious in every way that I can imagine. She is completely potty trained, and has never piddled on the floor inside. I am crating her at night and when I'm away from home for her own comfort and safety. We had some whining on the second night she was here, but usually she gives it up after about 30 seconds. Gabby is so full of love and joy for me and all of my friends. She is the happiest little girl I've ever seen. Her vet checked her out on Tuesday this week, and proclaimed her healthy and sound. What a relief. I would have never been able to give her up if she did not do well on this exam. Kathy, I really enjoyed meeting you last Monday. Keep up the good, hard work as a breeder of these darling dogs. Such treasures you provide for those of us who love our pets! Gabby's first haircut...notice the silver making it's way to the surface. Gabby's first experience with THE WHITE STUFF...imagine running and leaping and rolling and spinning! He is a wonderful boy and incredibly smart. I can't believe it sometimes. He is almost due for his last set of shots and then he will be rockin' and rollin' with us doing some running and hiking up some mountains. I know he is ready now considering he is such a ball of energy. We just wanted to wish you a happy holidays and give thanks again for giving us such a wonderful addition to our family! 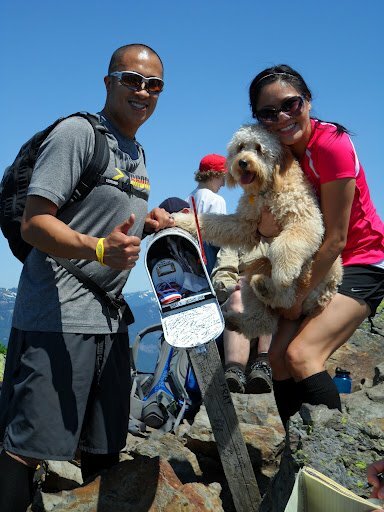 Thought I would send you some pics of Doja...couple are from the top of Mailbox Peak Hike in North Bend (he beat everybody to the top), one is on fourth of July, one is of him and I running at Greenlake, and one is one of our engagement pictures. Wibur is the most brilliant, loving, caring, cuddling, playful and amazing dog I've ever met or owned. He has been a huge blessing to our family. He never has a bad day and is always trying to serve others. He is unbelievably smar where he can high five and even go retrieve a specific toy you ask him to go get around the house. 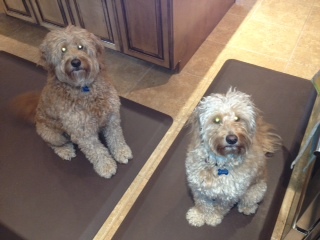 I would recommend this breed and purchasing from Solid Gold Doodles over all other options. Here are some pictures of Pepper at 9 months old. She still has her darling white chin and super soft coat, which is getting a bit lighter as time goes on. She is very smart and affectionate and loves to be by our side. Thank you for providing us with such a great addition to our family!